Le Castellet, France: Lewis Hamilton secured pole position for the French Grand Prix ahead of his teammate Valtteri Bottas as Mercedes dominated Saturday’s crash-hit qualifying session to sweep the front row of the grid. 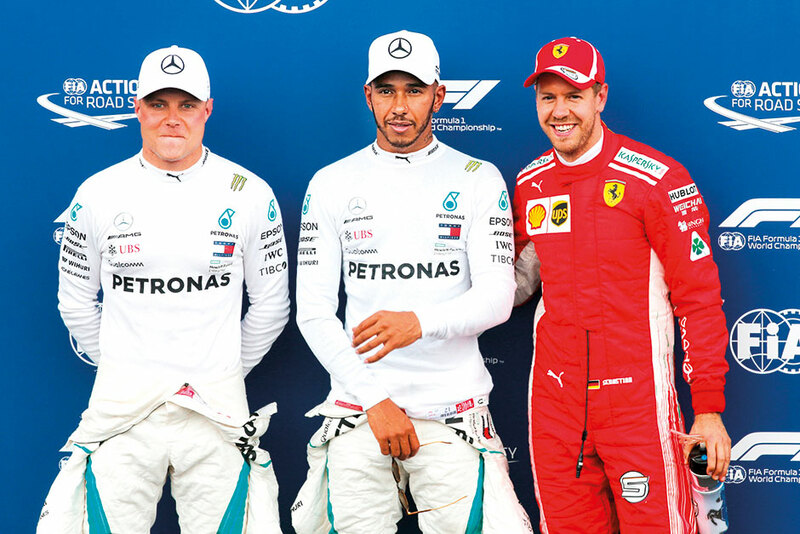 Championship leader, and fellow four-time world champion, Sebastian Vettel of Ferrari was third, three-tenths off the pace, ahead of Max Verstappen and his Red Bull teammate Australian Daniel Ricciardo. Kimi Raikkonen was sixth in the second Ferrari ahead of Carlos Sainz of Renault, Charles Leclerc of Sauber, Kevin Magnussen and his Haas teammate Romain Grosjean, who crashed during the top-ten shootout, halting the session for eight minutes. Bottas had earlier topped the times to maintain Mercedes supremacy when the third and final practice was severely curtailed by a heavy rainstorm on Saturday. The Finn clocked a best lap of the tricky Le Castellet circuit in one minute and 33.666 in the opening eight minutes before rain swept across the track. That was enough to lift him 1.2 seconds clear of Carlos Sainz of Renault and well ahead of highly-rated Monegasque driver Charles Leclerc of Sauber and Fernando Alonso, who was fourth for McLaren. The rain relented with nine minutes remaining to allow a number of drivers to venture out and test the conditions with ‘wet’ tyres, but it had little relevance to the outcome. After several days of heat-wave conditions, heavy thunderstorms are forecast to continue on Sunday when the first French Grand Prix for a decade, and first at Le Castellet’s ‘Paul Ricard’ circuit in 28 years, is scheduled to start.